Miami: Uber fraud involving fare adjustments to clean-up bodily fluid stains left behind by passengers is on the rise in Miami. This most recent scams involves Uber passengers being blamed for soiling the Uber driver’s vehicle with vomit. In other words, an Uber passenger will get dropped-off just fine, then notice an added fee tacked-on to their bill, holding the passenger responsible for soiling the Uber driver’s vehicle. The fee ranges from $80 – $150 depending on the Uber driver’s personal scam level. Sadly, there is not much the passenger can do but to contact the Uber helpline and receive a reply that does nothing to revert the clean-up fee, as it’s basically the Uber driver’s word against the passengers. In Uber’s defense, there exist rides in which passengers do indeed get sick during a ride for reasons which may go from motion sickness, to passengers boarding with an excess of food, alcohol, or narcotics in them. Whatever the case, Uber vomit fraud indeed exists in Miami. 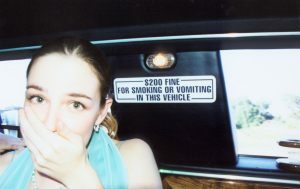 But what to do to prevent Uber vomit fraud? Firstly, report the case to Uber via the help button on the Uber website. Unfortunately, this may prove useless as the fraudulent Uber driver may have already submitted bogus photos of his/her soiled vehicle seat. Vomit is not alone when it comes to fraudulent clean-up claims by Uber drivers on unsuspecting Uber passengers. Liquids such as beer, wine, whiskey, blood, and even urine are on the clean-up list. As well as muddy footwear or soiled clothing leaving stains or odors. An Uber spokesperson has stated that they are looking into possible fraud cases to safeguard passenger satisfaction. However, it’s hard to prove whether or not a passenger does indeed dirty an Uber driver’s vehicle. The spokesperson added; “With 15 million trips a day, Uber is unfortunately not immune to these types of incidents.” Perazzo Law suggests passengers to send several emails to resolve their complaints by notifying Uber that there was no incident. After that, it’s a matter of waiting for Uber to investigate and determine whether or not to refund the clean-up fee. Sadly, not many bogus vomit claims go in favor of the passenger, with reported incidents of Uber canceling a passengers accounts on account of their legitimate gripes. Perazzo Law sheds light on How Safe Uber really is? Miami and North Miami Beach Law Firm serving Personal Injury Claims for Compensation following a Construction Truck Accident in Miami. 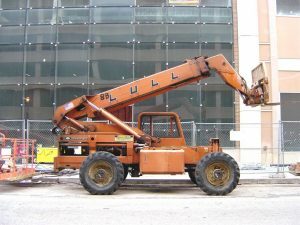 Two seperate Construction Truck Accidents lead to mayhem in Miami-Dade County: A local Fire Rescue spokesperson reported that a severely injured construction worker had to be airlifted to a nearby medical facility to receive emergency care for the injuries he suffered as a result by a boom lift that tipped over while operating at a Homestead shopping center. The worker, whose identity and condition is unknown, was badly hurt when the boom lift, or bucket truck, came crashing down on its side for reasons that are still unknown. This incident is just one of two that took place this past Thursday involving elevation construction vehicles, with both construction vehicles accidents leading to mayhem in Miami. The second incident occurred on Thursday evening in west Miami, when another crane started to rotate out of control and began taking down power lines. According to eyewitness reports, there was panic among the pedestrians and motorists that noticed the live power cables sparking and dangling overhead. Fortunately, there were no reported injuries but it has yet to be determined if any property owners, residents, or local businesses suffered losses due to the power outage, which took several hours to be restored. Apparently, the crane suffered a systems failure, a fact that insurance investigators and the attorneys representing property damage claims (if any) must verify to determine if there was negligence on behalf of the crane operator, the vehicle owner, lesser, construction firm, or any other third party involvement. 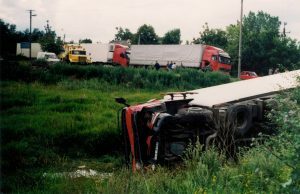 The Perazzo Law Firm has ample experience handling all sorts of Truck Accidents that involving a vast of range of trucking accidents including; Private, Public, Commercial, or Emergency Vehicles. See Trucking Accidents Compensation Claims accidents for further insight into accidents involving trucks in Miami. Broward: Trucking accidents in Miami are not as common as car, motorcycle accidents, or bicycle accident in Miami, but when truck accidents occur on a Miami Roadway, they many times end in tragedy, and sometimes on Miami streets. The most recent motor-vehicle accident to take place in Miami occurred this past Saturday when a semi-truck plunged 80-feet onto a patchy area of urban grass. At approximately 6:30 a.m., a 29 year-old trucker was operating a late model Kenworth T600 semi along the southbound lane of the Florida Turnpike. 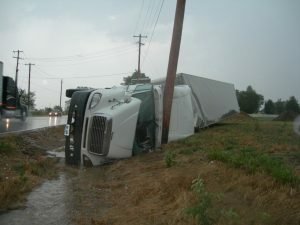 According to the Florida Highway Patrol, the truck driver lost control of the vehicle when taking the off-ramp which connects to Interstate 595. Trucks hauling heavy loads can become difficult to control and require greater care to avoid a trucking accident on Miami roadways. Tractor trailers and semi-trucks can many times be overloaded and must be maneuvered with added when exiting elevated ramps, like the one in Broward County, which was where the semi truck in question lost control and crashed through the right-side concrete wall of the ramp. The accident victim and his truck, which was hitched to a 53-foot trailer, lunged off the elevated section of the exit ramp and encountered an 80-foot drop onto a solid patch of grass in a residential area. The authorities have not reported on other injuries and are trying to determine the cause of the Miami trucking accident which resulted in a tremendous fatal crash. Any trucking accident involving a tractor trailer may include driver negligence due to his/her operating the vehicle while drowsy or under the influence of narcotics or alcohol. Cell Phone use while operating a tractor trailer has also been the determining factor in many Miami truck accident cases handled by the Perazzo Law Firm. Poor tractor trailer maintenance may include bad brakes, bad tires, broken mirrors, or malfunctioning instrument panel, all of which can be determining factors in a tractor trailer accident, as well as excess cargo, slippery roads and streets, or poor highway conditions. The above mentioned factors may automatically hold the tractor trailer driver and/or tractor trailer owner liable for any injuries, damage, or loss inflicted on other motorists, pedestrians, or property owners. A truck driver or trucking company may be held liable if any of the above mentioned factors can be proven by one of our personal injury lawyers in representation of their client’s personal injury claims for compensation. As previously stated, a truck driver has a duty to operate the vehicle under the proper conditions and avoid negligence behind the wheel. Miami-Dade: Not necessarily does a City Transit bus have to run into another car or run somebody over to be on the receiving end of a personal injury claim for compensation. On many occasions, buses lose control for reasons other than human error and crash into buildings, houses, or shops. When this happens, the property damage entailed due to the negligence on behalf of a bus company and/or the recklessness of the bus operator can be devastating. Nevertheless, bus companies and/or operators aren’t always to blame for injuries or property damage from bus related accidents. In one of the most recent bus related accidents in Miami involving property damage, a northbound Miami-Dade County transit bus drove straight into a corner design boutique shop after it crashed into a truck that had run a red light at a busy Miami-Dade intersection. The bus spent five days lodged within the Little Haiti corner shop, with the impact of the crash having a devastating structural effect on the stability of the 92-year-old building, which sadly, will need to be demolished. To make matters worse for the property owner, neither did he nor the driver of the pickup truck that blew the red light which caused the accident have any sort of insurance to protect them from personal injury or property damage. Public buses are operated by the City and have strict rules regarding compensation for personal injuries and property damage. In this particular case and according to a spokesperson for the City Transit Authority, it seems that the city will not be granting the property owner any compensation for the damage to the property by the bus. In fact, the city presented a demolition notice upon the crashed bus’ removal from the shop a few days ago. Apparently, the bus impact and its arduous removal led to destabilizing the building’s support columns and compromising the entire structure, according to Miami Fire Rescue teams, who added that the building was in danger of collapsing if structural support wasn’t added immediately. Sadly for the owner, who’s owned the property since 1988, the entire building is set to be demolished in October to prevent any further risk of property damage or personal injury. The question is; Does the property any right to claims for property damage or loss as a result of the accident that led to a bus crashing into the shop and the building now on route to be brought to the ground? For the answer to this question, contact the Perazzo Law Firm ONLINE or visit the Homepage to chat with one of our expert Personal Injury attorneys. Miami Beach: Part of a 2,700 foot wall extending into the Indian Creek Waterway may have to be torn down due to illegal building permits purposely overlooked by Miami’s chief building engineer. The Indian Creek Seawall, which cost the city some $25.5 million to build thus far, was meant to provide adequate driving conditions and prevent flooding in the event of severe rises in sea levels, especially during the ever-worsening hurricane season. According to official reports, the wall was built without the corresponding permits, and thus must undergo a multi-million dollar project to repair the former engineer’s blunders. Though the project was suspended in January, the modifications are expected to resume sometime in the near future. Despite only a part of the wall having to be torn down, the rebuilding process is expected to the represent an estimated $800,000, an depends highly on the landowners willingness to allow construction of the wall on the land. However, failure to comply of the city’s request to build a seawall on behalf of the landowners, could lead to the city imposing a tax to help pay for the wall. Florida Rest Stop Robbery? While driving a refrigerated box truck along Interstate 75, a drowsy Florida truck driver had the peace of mind to pull over to catch some zees at a rest stop. Sadly, what he caught was a beating by two individuals that apparently set out to rob both him and his cool cargo. After being dragged out his cab half asleep amid the morning dew, he was not only severely beaten but also shot in the shoulder, according to his testimony and reports from the Collier County Sheriff’s Office. Thus far, investigators have been able to verify that the truck cargo area had been searched by the aggressors, but unsure if anything was stolen. Though the victim has not released any public statements, he has been released from the hospital and recovering from his personal injuries at home. No suspects have been arrested and police are appealing to possible witnesses to provide any leads. If you, a loved one, or family member has suffered personal injury from aggravated assault or battery, the Perazzo Law Firm urges you to contact our Miami office Online or Call (786) LAWS-411 to a Free initial consultation to discuss your legal right to personal injury claims. Two woman were charged with aggravated battery after beating the crap out of two other women waiting at a quiet Florida intersection. The one-sided brawl took place at a traffic light when an argument led to the woman in the passenger seat getting beaten repeatedly with a baton by the passenger of the car behind them. Meanwhile, the driver of the car at the traffic light, in a failed attempt to calm things down, was met by approximately 15 thunderous uppercuts to the head before she dropped to the ground badly injured. Fortunately for the two women on the receiving end of this vicious beating, a bystander intervened before they were pummeled any further. If you, a family member, or loved one has suffered Personal Injury as a result of road-rage or any aggravated attack by another individual, the Perazzo Law Firm urges you to Contact Us Online or Call (786) LAWS 411 to receive your Free initial consultation. Living in South Florida offers many advantages; just ask any of its residents that enjoy the year-round sunshine and white sandy beaches. Sadly, the threat of flooding from the ever-growing number of severe weather conditions may cause flood insurance rates to swell to new heights. According to the Federal Emergency Management Agency, flood insurance rates are expected to sore in the very near future; which could significantly sink the budgets of the households that reside along the East Coast. With the U.S. Senate meeting real soon to tackle the flood insurance matter, home owners need to find-out for sure where they stand when it comes to the amount of coverage insurance provider will offer once the flood-waters come a knocking on their door.